Depicting energy at its most dramatic and brutal, CROSSROADS (1976) is a montage of declassified US Government archive footage of the first underwater atomic bomb test at Bikini Atoll in 1946. 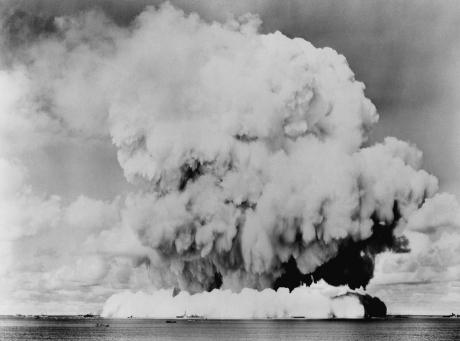 The devastating explosion was captured for research purposes by 500 cameras stationed on planes, boats and land around the atoll. This film, by the seminal American filmmaker Bruce Conner, was a collaboration with musicians Patrick Gleeson and Terry Riley. Conner invited each to compose a different score, which provide contrasting backdrops to the fearsome yet stunning visual images. Bruce Conner (1933 – 2008) was an American artist renowned for his work in assemblage, film, drawing, sculpture, painting, collage, and photography. He began making short films in the late 1950s. Conner’s first and possibly most famous film was A MOVIE, made from found footage set to a recording of Ottorino Respighi’s Pines of Rome. 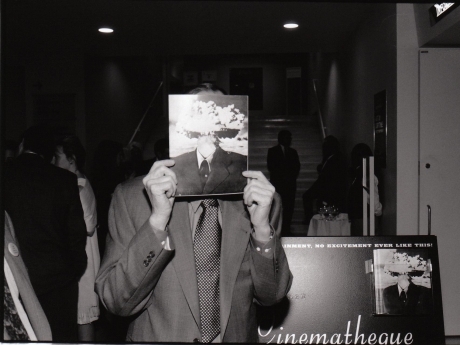 In 1994 A MOVIE was selected for preservation by the United States National Film Registry at the Library of Congress. He was one of the first artists to use popular music for his film soundtracks, with his work considered by some as the precursor of the music video. Curated and produced by AV Festival 10. Regional Premiere.